A determined group of the Team, well kitted out in ‘typical’ May garb – thermal caps and over-trousers – met at the appointed spot to be welcomed by Bill Morton, an experienced local birder and author of the Frodsham Birdblog (click on this link), which recounts our experience so well, that I have decided to take a week off from report writing. All I would add is (1) that I felt we had a really good opportunity to familiarise ourselves with some bird song, of Sedge Warblers and Whitethroat in particular; and (2) that I have never been quite so close to Swifts that were skimming over us along the banks of the Weaver, literally just a couple of feet above our heads. 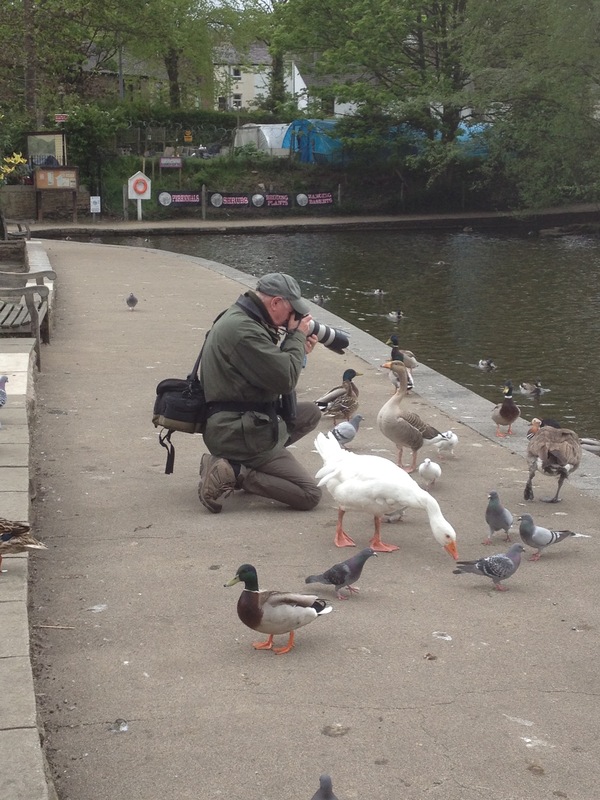 Anyway, many thanks again to Bill for being so informative and making our morning so enjoyable (despite the weather!). A good number of the Team gathered in the Visitor Centre car park of what is one of the UK’s oldest Country Parks, having been opened in 1968, and which was officially designated a Local Nature Reserve in 2000. Mobbed by ducks, more used to being fed than ‘observed’, and pausing only to admire the model yachts being put through their paces in the coolish breeze, we set off past the Visitor Centre and towards the weir, which in past times had been used to collect and control the water from the River Etherow to power Compstall Mill. Before we had walked more than a couple of hundred yards, a sudden heavy downpour, which forced us to seek shelter under the broad-leaved trees lining the path and that lasted for about ten minutes, had many of the Team perhaps thinking of cutting short the expedition, but a few hardy souls determinedly pressed ahead and, with mention of possible sightings of wagtails and dippers, the rest fell in behind. And we were not to be disappointed, since not only were Mandarin ducks present in good number, both the gaudy males as well as a few less brightly coloured females, but as we approached the weir (and the sun came out!) we had good sightings of what turned out to be a pair of Grey wagtail and a tantalising glimpse of a Dipper down below on the river. Although at this point we lost sight of the Dipper, it was seen again on the top step of the weir and everyone was able to enjoy a clear view of this often hard-to-spot bird. Across the weir, we were confronted with a number of ‘Private’ and ‘No entry’ signs and may well have turned back, had not Hilary confidently led us forward (a bit local knowledge is always an advantage) towards an area of the park being actively managed by the Cheshire Wildlife Trust and to a small hide overlooking a large pool on the far side of the River Etherow from the main reserve. Although there was little to see from the hide itself, in the woodland around there was plenty of activity and we had good views of Nuthatch and a Great-Spotted Woodpecker active in the trees overhead. Retracing our steps to the weir, with brief views of Sand Martin and what seemed to be a single Swallow, we now followed a circuit through Keg Woodland. 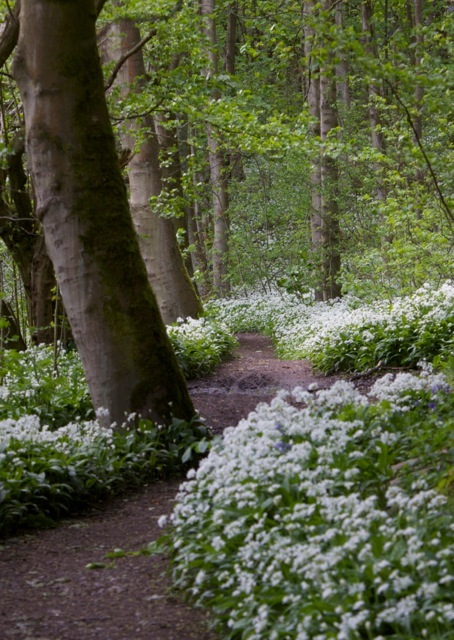 Senses were soon assailed by the sight and smell of huge swathes of wild garlic (see below) and bluebells, the latter sometimes beautifully lit up by the sunshine filtering through the trees, and by the tantalising sounds of a variety of woodland birds. Getting views of the birds was difficult, however, with most of the trees at least partially covered in leaf, but patience was rewarded for some (not always the same few) with sightings of Chiff-chaff, Blackcap and Goldcrest. Pausing to get our breath after a steepish climb at a view point, from which Anne reported having watched the migration of Red wing and Fieldfare, we caught sight of a distant Buzzard circling above the hill on the other side of the valley. With renewed energy we pressed on towards Sunny Corner, the furthest point of our circuit, some catching a glimpse of an Orange Tip butterfly in one of the patches of warm sunshine. Following the path round, we passed a couple of large Owl boxes on the edge of the woodland, without sight unfortunately of any occupant, before descending towards Keg Pool. 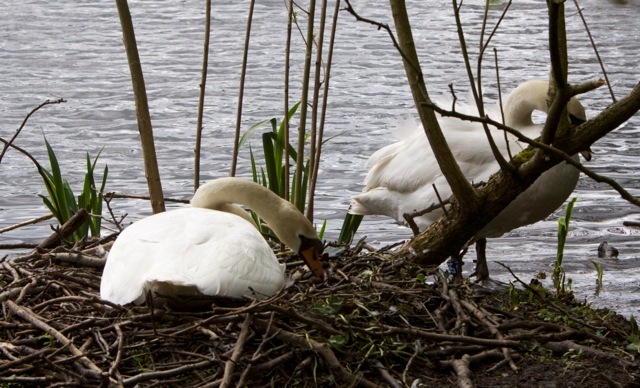 Here we saw a Mute Swan on its nest, close to the path, but there was, surprisingly, little else on this fairly large expanse of water. Finally, as we made our way along the path between the Pool and the river, those most alert amongst us were rewarded with the flash of a passing Kingfisher, heading downstream. Feeling the call of lunch and aware of dark clouds gathering overhead, the team now put a collective best foot forward and headed back towards the Visitor Centre and the car park, but not without enjoying the sight of young Mallard and Moorhen, the latter being assiduously fed by a parent that appeared to catching flies on the water before passing them on to its chick. The threatened shower broke just as most of us had made it back to our cars, well content with a good morning’s birding. A couple of months ago when the weather was still happily buffeting Team Tuesday about, whilst out on their weekly jaunts, a date was set for what held promise of a sweet becalmed morn in May when the changeable first month of spring (April with its expected showers) gave way to a blossom blessed saunter of a day upon which we could wander onto my beloved Moss-lands. Thus with this image in mind the 5th May was innocently scribed into diaries allowing ‘Tomorrow, and tomorrow, and tomorrow’ to creep in its petty pace’ until this very morn when blinds and curtains revealed this Lake Woebegone of a day howling its way from the Southwest threatening nought but a total washout of a wander—–but then again when has the weather EVER put TT off from turning out—well apart from that one day at Moore when I was left to view a Bittern for at least 5 minutes ALL ON MY OWN—putting that aside—-sure enough in a rain swept car park in Irlam all members of the ‘WE LOVE DAVE’S MOSS’ fraternity had arrived on time and ready to do ‘battle’ upon the nearby ‘plains’! A buffer zone of tranquillity was, I admit, first happily ‘retired to’ where we happily re-grouped in the extremely welcoming ‘Cafe by the Lake’ which proudly sits within the grounds of Moss Farm Fisheries allowing all to consider the day ahead cuppas in hand. This huddle of a comfort zone then allowed the rain to ‘go-wander’ elsewhere freeing our feet to first step about these amazing fisheries which whilst serving the needs of keen fishermen also provide a haven for wildlife – even on such a blustery day thus before we set off onto the open moss-lands Swift/Swallow/Tufted Duck and Linnet set off our day list (the adjoining half of this once sometimes bland farmed field also gave Lapwing/Mistle Thrush and Pied Wagtail). Dixon’s Wood which earlier rang out with bird-song kept most of its inhabitants quiet as they sheltered from the wind but we did manage to catch snatches of a song from a Blackcap as we made our way over to Croxden Pools. A ‘testing’ wind howled about our well-clad frames pushing binoculars hither and thither but in-spite of this observational hindrance we still connected with Redshank/Curlew and thanks to the eyes of one of our new ‘recruits’ a lone but very welcome Black Tailed Godwit. In turning our eyes from the Pools a male Wheatear then lit up the adjacent and somewhat uninspiring landscape which is a sorry testimony of man’s greed and ignorance in turning one of the UK’s rarest habitat (Lowland Raised Peat-Bog) into a brown flat-land, cruelly devoid of its once vibrant mix of Sphagnum/Heather/Cotton Grass /Purple-moor Grass sweep of nature supporting a micro Amazon Jungle mix of insects and birds, all in the race for cheap peat—(in my opinion NOTHING is cheap: something always pays a price and this something is usually our flora and fauna). Moving westward (for we all relished the challenge of striding into the teeth of this day’s gusting wind) we step by solid step made our way over to Little Woolden Moss which gave our collective a burst or two of Willow Warbler song as one or two of these Summer Migrants faced up to the wind and proclaimed their territorial syllables for all of their twelve centimetres was worth! The Pool adjacent to the now well appointed pathway that runs round most of this Reserve then added a mix of spice to our day’s wader list, for out upon this now brightly lit ‘in-restoration-phase-from-a-harrowing-life-of-Peat-extraction-107-hectares-of-a-Lancashire-Wildlife-Trust’ Reserve (in my opinion the best thing that has ever occurred on My Mosses) stood Little Ringed Plover/Ringed Plover/Dunlin and Oystercatcher, whilst above it flew Swallow and Sand Martin. A final push was made in order to gain the new Hide and pay homage to a Ten-Thousand Year Old Bog Oak (all surely falls into place when we can see such artefacts that really put into perspective our ‘walking shadow’, which in my opinion should cast itself in saving rather than destroying nature! Lunch then called all back to the lovely cafe thus without further ado we allowed the wind to aid our ‘yomp’ back which was at times happily interrupted by a Goldcrest/a Whitethroat and a pair of Yellowhammers.